Myopia is the medical term for nearsightedness. It means that the eye sees distant images as blurred or fuzzy. For some people that distance may be only a foot or two. Myopia is caused by light being focused in front of instead of on the retina of the eye. 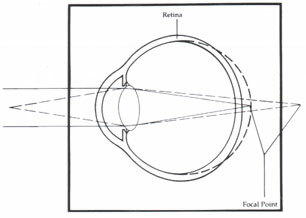 The cornea (the clear front part – or window – of the eyeball) is the eye’s major focusing part. Corneal curve determines its focusing power. The steeper, or more curved, the cornea, the greater the focusing power. Often in myopia, the cornea is curved that it has too much focusing power. 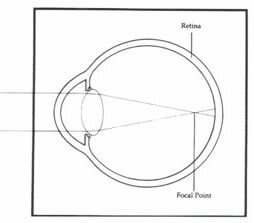 If this curve is lessened or made flatter, then light is no longer focused as far forward in the eye but rather nearer the retina. The eye may also be longer in length than an average eye. It is generally believed that there is a genetic predisposition to myopia. The condition may begin anytime from early childhood until the late teens, but it usually stabilizes in the early twenties. Patients with mild myopia often complain of night driving difficulties. The doctors at the Eye Surgery Institute can treat myopia with glasses, contact lenses or refractive surgery such as lasik and epi-lasik. Hyperopia, or farsightedness, is a condition that causes a point in space to focus behind the retina. Often, farsighted people can see distant objects clearly but have difficulty reading. As a hyperopic person ages, he or she can also lose distance vision, because the eye loses its ability to change as easily. Therefore, when a person is farsighted, he or she often needs corrective lenses for both distance and near vision. Hyperopia is caused when the eye is too short from front to back, or when there is a weakness in the focusing power of the lens or cornea. 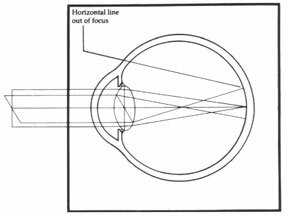 The focal point of parallel lines in a farsighted person is behind the retina. Hyperopia generally is present from birth and usually is diagnosed in early childhood. Hyperopia tends to run in families, and it gets worse with age. The doctors at the Eye Surgery Institue can treat hyperopia with glasses, contact lenses, lasik or epi-lasik. Distorted vision, medically known as astigmatism, is a condition in which vertical lines might be in focus, but not horizontal lines, or vice versa. Diagonal lines might also be out of focus. Distant points in space become a blur on the retina. Astigmatism is caused by an uneven curvature of the cornea. It results when one axis is stronger than the other, causing a blurring on the retina. In other words, one axis focuses differently than the other. High astigmatism can cause double or ghost images. A person can have a little or a lot of astigmatism. Sometimes it occurs in conjunction with nearsightedness or farsightedness. Astigmatism may change with age. The doctors at the Eye Surgery Institute can treat astigmatism with glasses, contacts lenses, lasik or epi-lasik. Many people think a cataract is a skin growth over the eyes or something outside of the eye that blocks vision. Actually, a cataract is cloudiness or opacity in the lens inside the eye that gradually blurs sight. One of the most noticeable differences is that after cataracts have formed, colors seem less brilliant, almost muted. The complete biochemical cause of cataracts is not known. While most cataracts develop gradually during aging, some occur after eye trauma or inflammation. Cataracts can also be associated with diabetes, gout, and other diseases. Less frequently, cataracts can be congenital, affecting babies or young people. Blurred vision, the key symptom of cataracts, gradually worsens over a period of months or years. Colors become less distinct, and often vision fades, especially in dim light. Night driving may be greatly impaired. 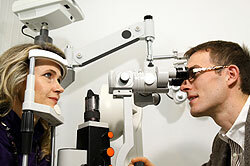 Patients may complain of difficulty with near vision or distance vision. Cataracts usually develop bilaterally, but progress at different rates so vision in one eye may be better than in the other. The doctors at the Eye Surgery Institute can diagnose a cataract with a complete eye examination. Glaucoma, an eye disease that is fairly common in adults as they age. It is is one of the leading causes of preventable and treatable blindness in the United States. Glaucoma is a condition in which fluid in the eye does not drain properly, often causing increased pressure that can impair the functioning of the retina and optic nerve, both vital to good vision. Some patients with glaucoma do not have elevated eye pressure. The doctors at the Eye Surgery Institute can diagnose glaucoma with a comprehensive eye examination. Prompt diagnosis and treatment have proved to be effective in minimizing loss of vision due to glaucoma. Patients with glaucoma need to be monitored regularly. If treated too late or not at all, glaucoma can eventually lead to blindness. Diabetic retinopathy is one of the leading causes of blindness. The chances of developing diabetic retinopathy is related to the length of time you have been a diabetic and the control of your blood sugars. Regular dilated eye examinations are very important to diagnose and treat diabetic retinopathy. With diabetic retinopathy changes to your vision may not be noticeable at first. In its advanced stages, the disease can cause blurred or cloudy vision, floaters and blind spots and, eventually, blindness. More advanced stages of diabetic retinopathy can often be treated if properly diagnosed. The damage from diabetic retinopathy can be irreversible. Diabetic retinopathy is a leading cause of blindness in American adults. Macular edema, which is leaking fluid that causes blurred vision, often occurs with diabetic retinopathy. Fortunately, diabetic retinopathy is often preventable. Your risk is reduced if you follow your prescribed diet and medications, exercise regularly, and control your blood pressure. Regular eye exams are an integral part of making sure your eyes are healthy. Diabetic retinopathy can be detected with a complete eye examination including dilation. The macula is a part of the retina in the back of the eye that ensures that our central vision is clear and sharp. Age-related macular degeneration (ARMD) can affect your central vision. ARMD becomes more common as we age. Early stages of ARMD may have no symptoms. ARMD can only be properly diagnosed with a dilated eye examination. Patients may experience anything from a blurry, gray or distorted area to a blind spot in the center of vision. ARMD doesn’t cause total blindness because it doesn’t affect the peripheral vision. ARMD affects your central vision. This can make it difficult to read or drive a car. There are 2 broad categories of ARMD, dry ARMD and wet ARMD. Wet ARMD can be treated with injections of medication into the eye. The doctors at the Eye Surgery Institute often recommend vitamins which have been shown to decrease the risk of progression of ARMD. The doctors will often recommend monitoring your vision at home with an amsler grid. Possible risk factors of ARMD include genetics, age, diet, smoking and sunlight exposure. Regular eye exams are highly recommended to detect macular degeneration early and prevent permanent vision loss. If you are interested in learning more about our eye disease diagnosis and treatments at the Eye Surgery Institute in Dearborn, Michigan call 877-393-3326 today to schedule an appointment with Dr. Grandon, Dr. Kronenberg or Dr. Wang.